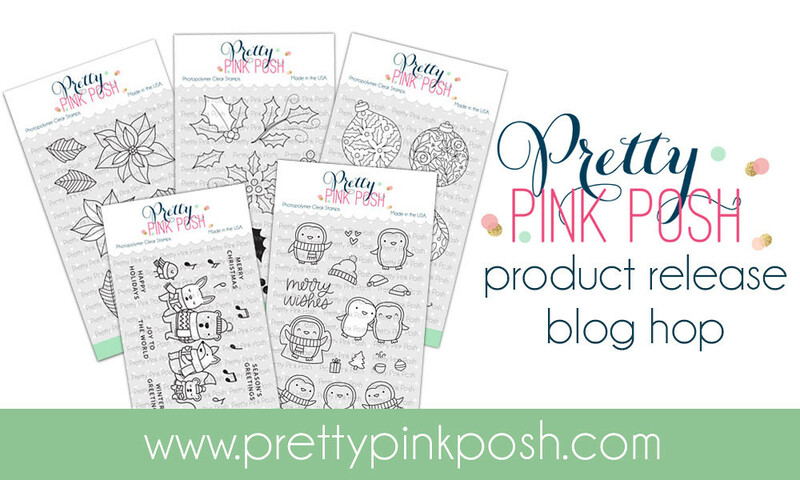 Hello and welcome to the November Release Blog Hop for Pretty Pink Posh! We have some wonderful projects to share with you using the newest products which are all available at Pretty Pink Posh now! For my first card I used the Poinsettias stamp set and coordinating dies along with Elegant Holly and coordinating dies. I blended Distress ink on Bristol Board card stock and sprinkled with water to create my background. The images were colored with Copic markers, cut out with the coordinating dies, and added with foam tape. The sentiment was cut out with the Happy Holidays Script die, layered three times and then adhered to the card with liquid glue. After I finished everything, I sprinkled a bit of white ink all over the card. 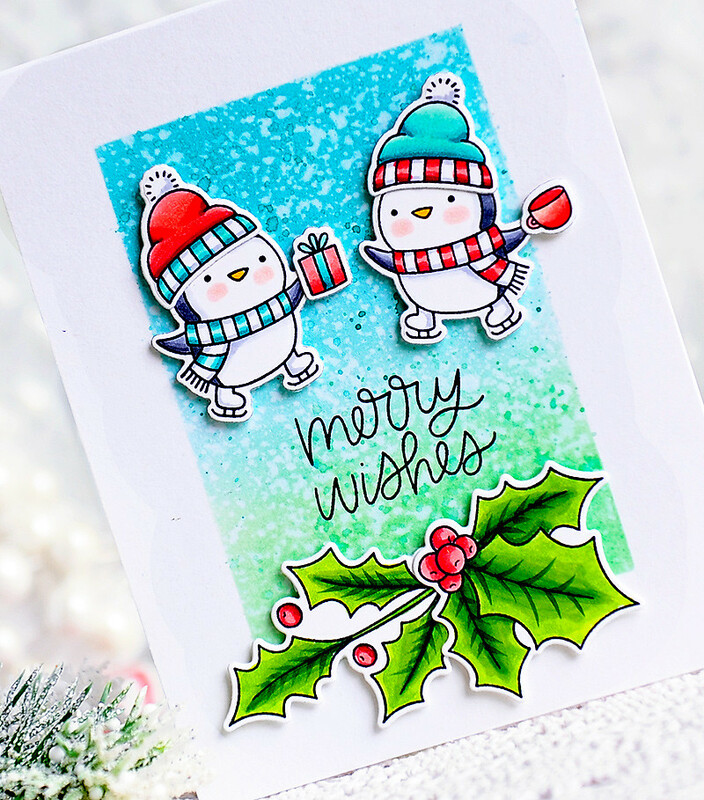 For my second card I used the adorable Penguin Pals and Elegant Holly stamp sets. For the background, I created a rectangle stencil out of card stock, then blended blue and green distress ink onto Bristol Board card stock, and sprinkled with water. I stamped the sentiment from the Penguin Pals stamp set in the center with black ink. The adorable images were all colored with Copic markers, cut out with the coordinating dies, and adhered with foam tape. And lastly I made these really cute ornament tags with the Stitched Ornament dies and the Starry Sky and Holiday mixes. I die cut the ornaments out of red and blue card stock, then cut the white borders and circles out of white. I cut the top of the ornaments out of silver glitter card stock. Then the fun really begin, as I sat down with my tweezers and added the beautiful little gems in different patterns to create these pretty tags! I used the Starry Sky mix on the blue ones and the Holiday mix on the red ones. I glued these down with Tombow Multi Mono liquid glue. When everything was dry, I threaded some silver string through the tops for hanging. There are 4 $25 gift certificates up for grabs (two winners each day). Winners will be picked randomly along the blog hop. Comments must be left by 11:59 PM PDT on 11/20/2018. Winners will be announced on the PPP blog. Thanks so much for stopping by! Enjoy the hop! Kay, your projects are simply AMAZING. The cards are so pretty and I adore those tags. TFS. Pretty works! I especially like your ornament tags. Oh so pretty and cute Kay! Kay, I can ALWAYS count on your cards to wake up beautifully! So bright, clean, and absolutely adorable ice-skating penguins! Each one of your creations are just so pretty! Love the ornament tags!!! 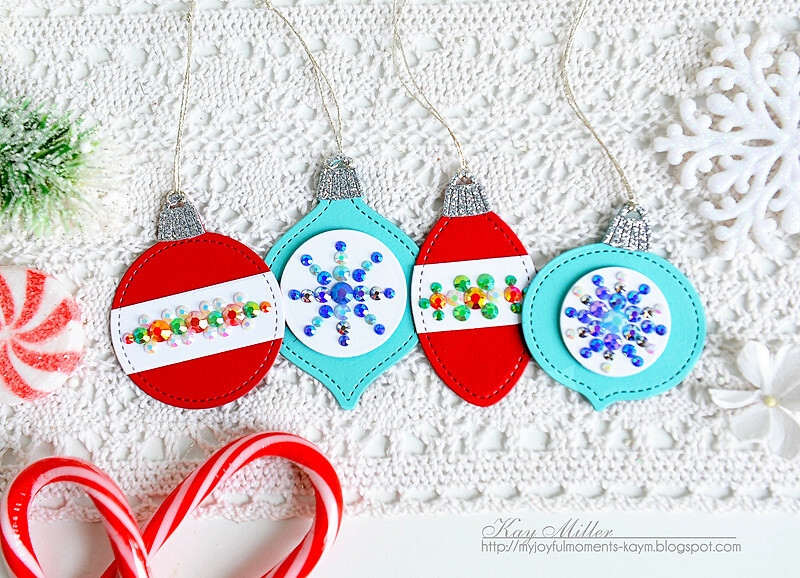 Really fun projects, love the bright cheery colors and love the ornament tags. Wow, do you have some awesome patience with gems! haha Great job, that's for sure. Love your tags and gorgeous cards! The BLING on those ornament tags. Omg. So much fun. Thanks. Your snowy poinsettia is awesome! Great cards! Wow, everything is so pretty! Love all your gorgeous projects! The poinsettia card is my favourite - simply stunning! Thanks for the inspiration! Love your snowy poinsettia!! So lovely!! Your penguins are adorable! Lovely coloring and background. Amazing ornaments with the gems!! WOW!! Absolutely amazing cards and ornaments! I love how you blended the distress inks and then spritzed them with water! Very beautiful looking! I also love the pretty gems that you put on your cute little ornaments too! Gorgeous cards and tags! So pretty! super projects - thanks for the inspiration!! Just love it when Kay Miller is on a blog hop list.... you never disappoint. Love the poinsettia and the penguin but this bevy of beautiful ornaments are show stoppers. Great job on all those gems. Wow! Your colouring is simply stunning! Wow love everything! Especially that first card! Stunning colors! I love the penguin one soooo much! Your work is spectacular Kay! Love these so much! Beautiful!! Love your penguins and those ornaments are gorgeous! Your cards and ornaments are wonderful. Love the beautiful poinsettia. This is one sweet post with adorable and gorgeous creation!!!! Oh my goodness, Kay!!! The first card is so beautiful in the red and teal. Your coloring is terrific and the white splatters are reminiscent of snow falling. The second card is adorable with those cute penguins. But the ornaments absolutely blew me away. The use of the jewels is all you! I can just see you in your glory working on these with your tweezers and your creative mind. Wow!! Thank you SO much for sharing! So cute, I love those tags too! Oh my!!! Your cards and the ornament tags are so beautiful!!! Stunning colouring!!! Love how you did your ornaments and that background on the penguins! So many pretty things! Love it all. I really like the ornament tags. 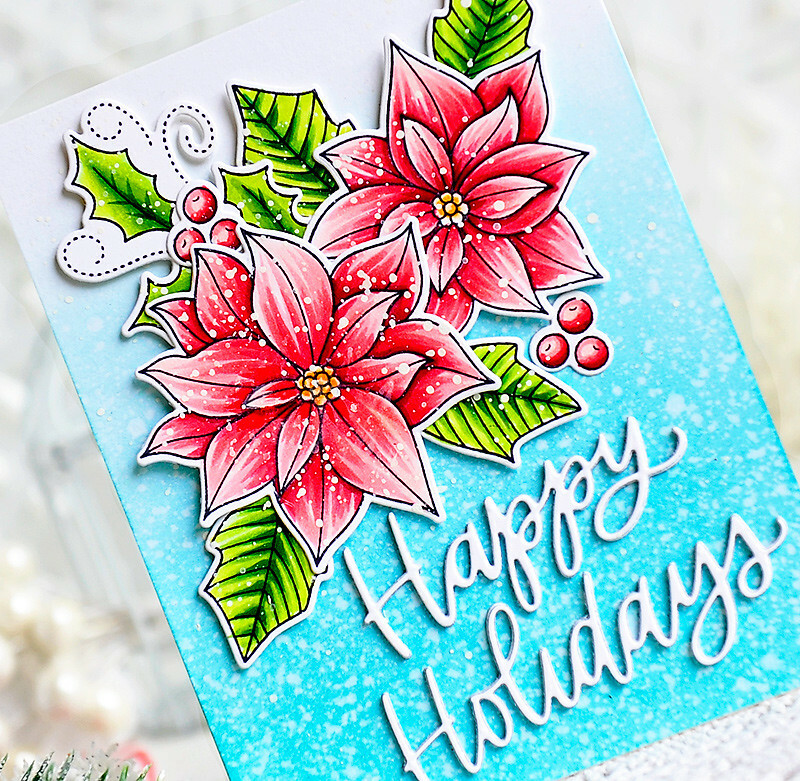 Your poinsettia card is so BEAUTIFUL! 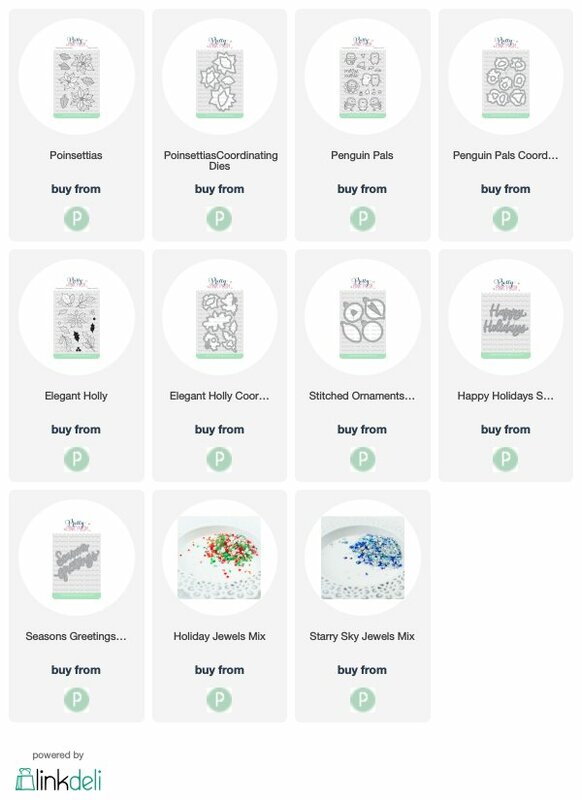 Your penguin card is super ADORABLE and your ornaments are absolutely STUNNING! Love them all! wow such stunning cards. Love that bear! Kay, everything is so bright and colorful! It feels so festive, and looks absolutely beautiful too! Inspired by you, as always! cards - really look "cold". I am a big fan of your work; and these beautiful cards with their vibrant colors are two of the reasons why! Love your cards; great backgrounds! Love the beautiful cards and ornaments!! So many gorgeous images and festive colors!! Love the new script sentiment dies and jewel mixes espeically!!! Wow, love your backgrounds!! What colors did you use to get that blue background? It's gorgeous!! Wonderful colors, cute tags and for sharing your work with us. Pairing the holly stamp set with the penguins turned out so good. I've never used as much water on the background as you have, but after seeing the outcome, I will begin using much more. Great job. Pretty poinsettias, cute penguins and love the festive ornaments. Both your cards are fabulous! 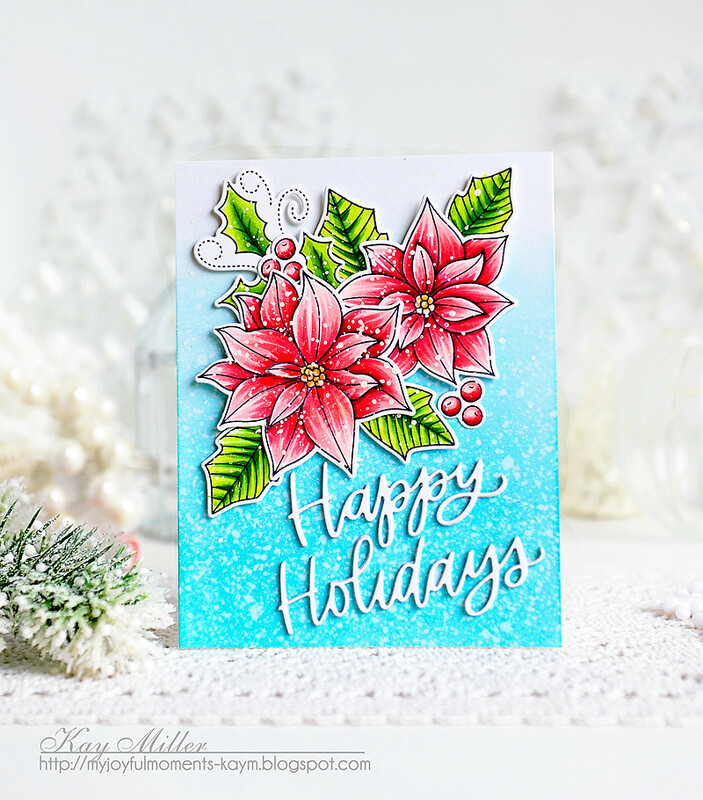 The poinsettias are lovely and the sprinkling of white, as well as the water on the background, give your card a snowy-feel. The penguins are adorable with their rosy cheeks! 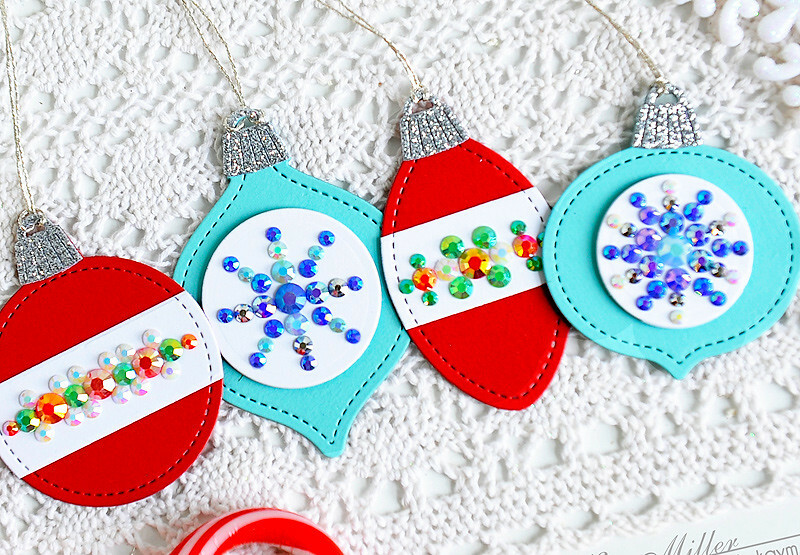 Your ornament tags are so pretty with all those sparkling jewels. Thanks for sharing such wonderful projects! These cards are so pretty! I really like those cute little penguins! Wow, what amazing projects! Stunning coloring and fantastic designs. Love the gems on the ornament tags. Wow, a steady hand required for your ornaments. All beautiful and great ideas. Thanks for sharing. Awesome cards and tags! Love the ornament dies! Gorgeous cards and those jeweled tags, WOW, stunning! All of your projects are gorgeous, but the ornament tags have really caught my eye. What a great job you did with creating the patterns with the jewels. Thanks for sharing such great ideas with us! You really made a Wonderful job. Wonderful projects. I love the cards and your backgrounds are amazing. Wonderful projects with a great color palette! I especially love those fun, festive tags! While I really like the cards, the ornament tags steal the show in my opinion. They are so cute!!! Love this idea! I love your projects. So bright and cheerful. the cards are beautiful and the tags are so so cute. Great looking cards and the tags are so nice. Gorgeous!! 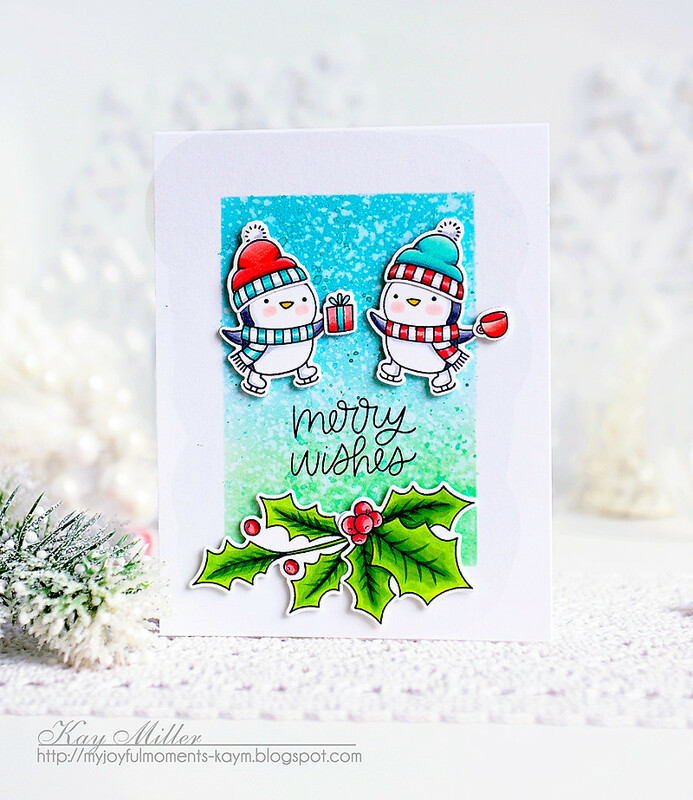 Love the fabulous backgrounds on the cards and those ornaments are adorable and to pretty! Its always so wonderful to see your creations. Love the cards and the ornaments are so pretty. Terrific creations! So cute and fun!